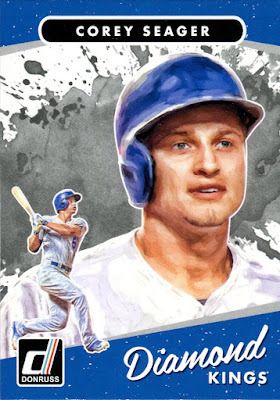 While the release of Topps Series 1 is an exciting time because it means the start of baseball card season, I was not excited about the design of this year's Topps. There are some inconsistent design elements and the colored backs come off too strong. After I bought a couple packs that I promptly traded away, I decided I would pass on opening any more flagship this year. I'll buy a factory set at the end of the year to satisfy my need to collect the full set. 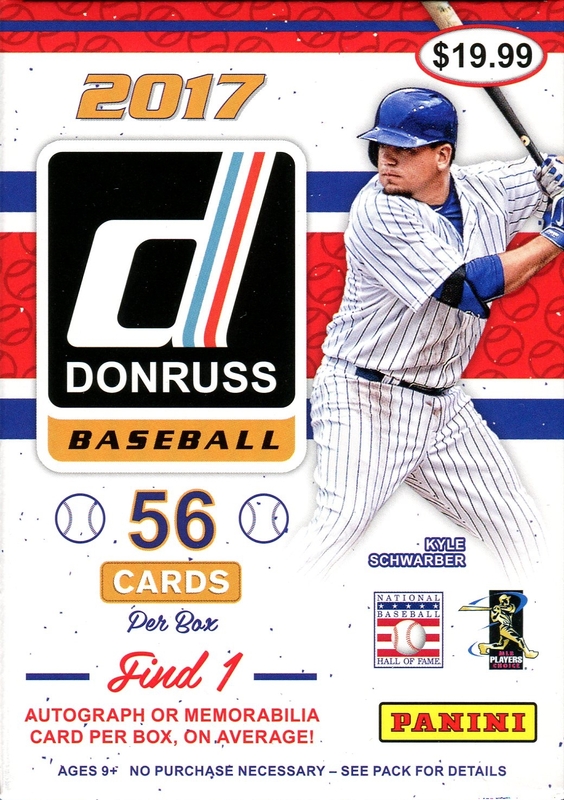 When I saw a preview of 2017 Donruss, I knew this would be a good alternative for me this year. The design is very similar to last years Donruss football, a design I regarded highly. 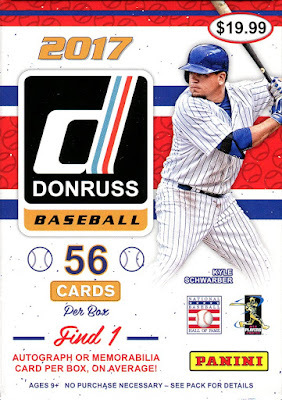 If there is any main competitor to flagship Topps, Donruss would have to be it. Retail boxes have started to pop up so I bought a blaster to see if this will satisfy my desire for a good base set. Only seven packs with eight cards per pack, which is about half of what would be in a Topps blaster box. 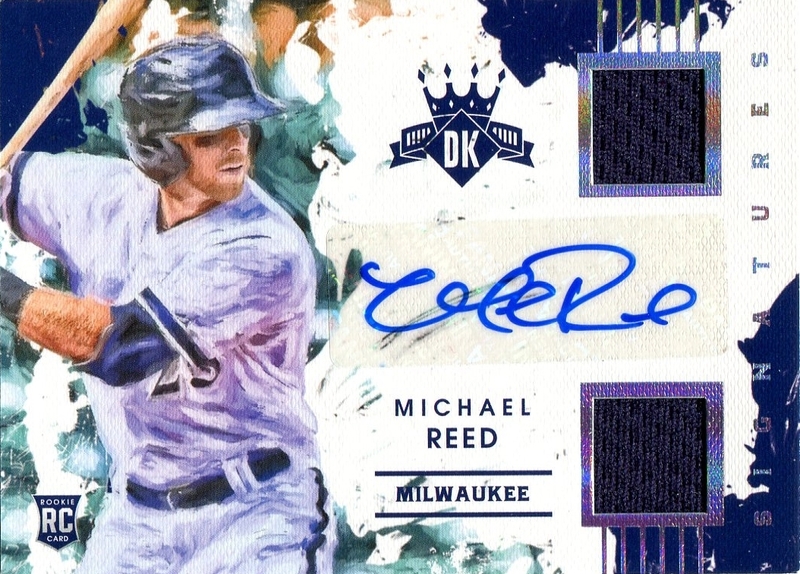 Although there is one guaranteed autograph or memorabilia card so that is a step above Topps' guaranteed manufactured relics. I wish the base design had full colored borders like the football but I still like the overall design. The gray backs look fine to me as not everything needs a blast of color. If there is one downside to this set it's that a lot of the photos feature similar poses. 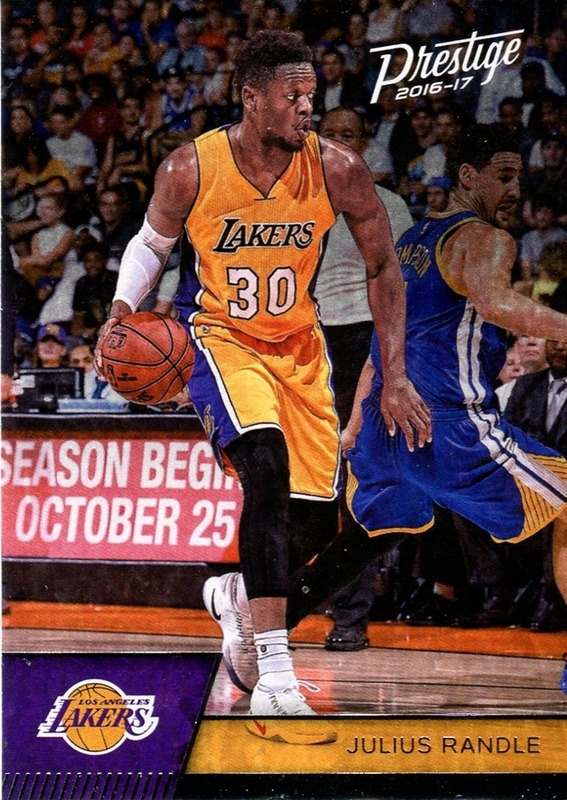 Perhaps Panini does this because it is easier to Photoshop out the logos. 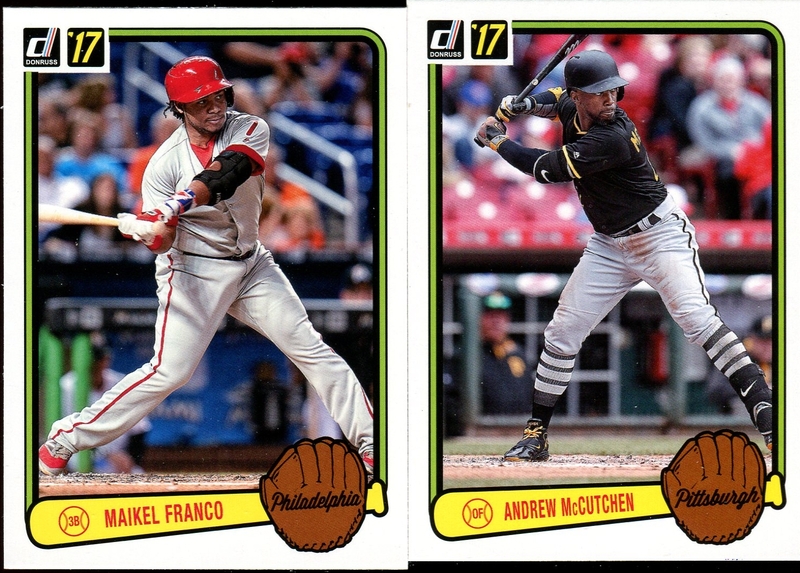 From what I have seen of this year's Topps flagship, their photo choices have some variation. With the stark white borders and similar photos, I'm going to dispense with showing off the rest of the base cards I opened. This is a name plate variation so it's worth showing off. I had to look up the story behind the nickname "Hakuna Machado" and it's actually rather clever. It's based off the Lion King and the Orioles even made a song featuring his nickname. I encourage you to watch it only because it's this kind of thing that reminds me how fun baseball is off the field. These cards are a throwback to the 1983 Donruss design. 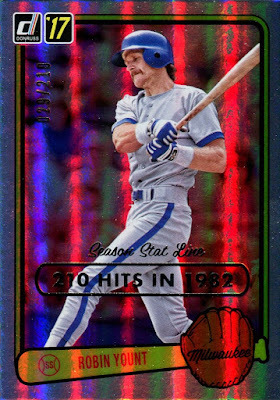 I have no nostalgia for 1983 Donruss (I wasn't even born yet) so these cards don't sway me one way or another. The design is faithful to the old 1983 design. These inserts came two to a pack for each pack so I'm not going to bother showing them all off. You've seen them once and you've seen them enough. I like that Panini will included retired players in their base sets. I lied above. Here's two more of the 1983 retros. I scanned these two before I decided to stop scanning them all. Now you won't see any more of these cards. 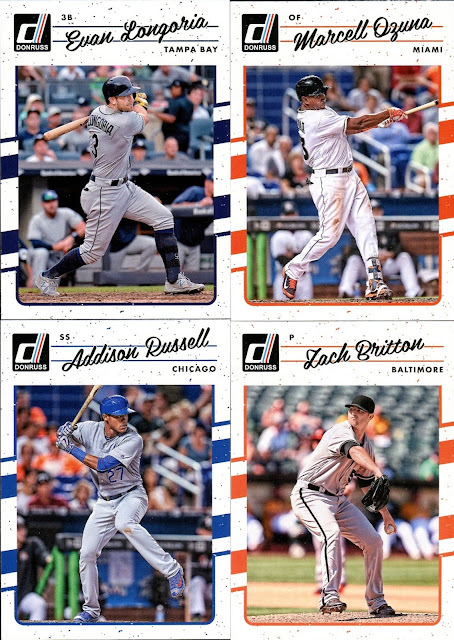 The Rated Rookie subset, which is a standard Donruss inclusion. 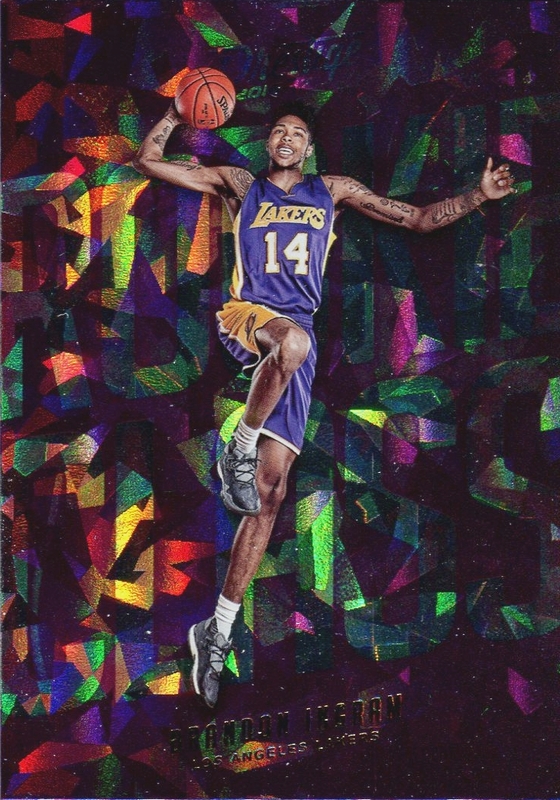 This is from The Rookies insert. I miss the days when the Astros were bottom feeders in the AL West. Give the Mariners their chance to win the West! 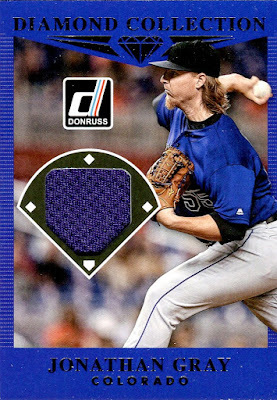 Another Donruss staple, the Diamond Kings subset. 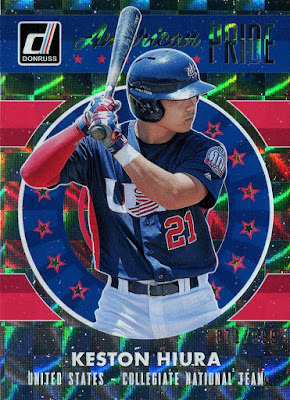 Since Panini has the license to USA Baseball, it only makes sense that they would include players from the national team. Hiura is a junior at UC Irvine and is projected as a high first round draft pick. 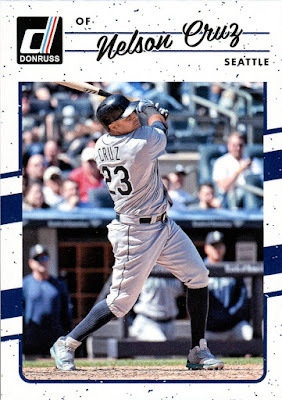 I couldn't find any up to date stats on his current season but at the end of February he was hitting .444/.515/1.074 with five doubles and 15 RBIs in seven games. I don't track college baseball prospects but I think I'll keep my eye on him now that I have his card. Last but not least, the guaranteed hit of the box. 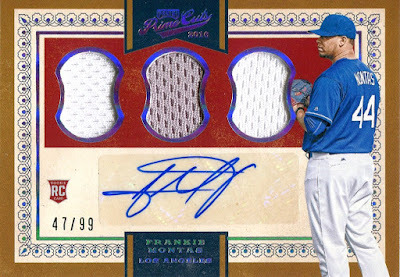 I was certain I would pull a relic as the guaranteed hits are typically not the autographs. This is a nice piece of purple jersey, a sight for sore eyes blinded by white jersey relics. I don't think I have any Rockies relics, either. Looking at the back, Panini says this is "player-used" material, which is code for "the player wore it for 10 seconds at Panini's request then took the jersey off." Oh well, I guess game-used was too much to ask. I still like the card. 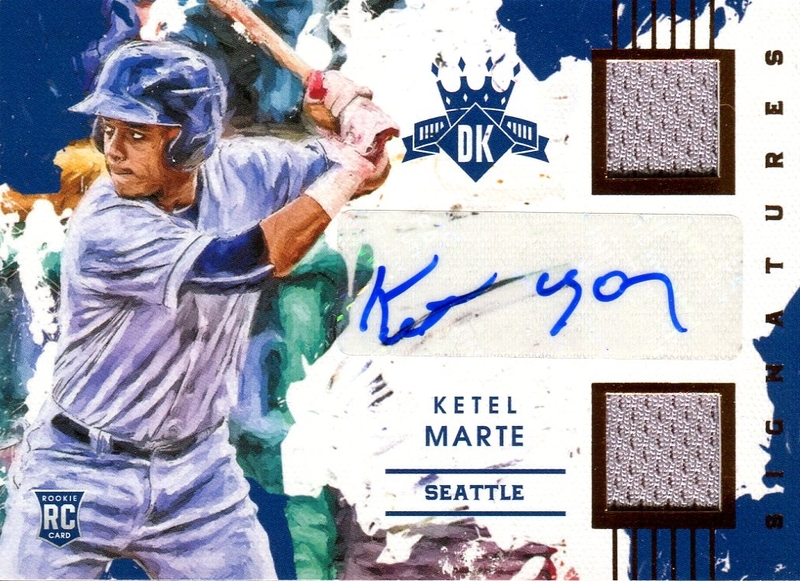 A solid effort from Panini and this year's base design is an improvement over last year. 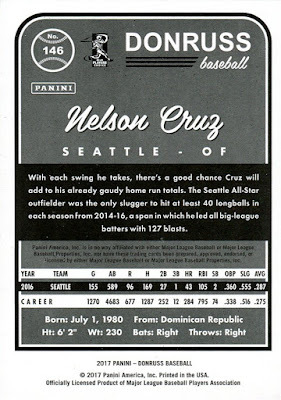 I love the USA Baseball insert and the Season Stat Line parallel. I don't expect this to be a set I chase this year but I'll likely pick up another box. There were no duplicates in this box, which is always a plus. Old habits die hard. Basketball was my favorite sport growing up yet I have only faint interest in the sport now. 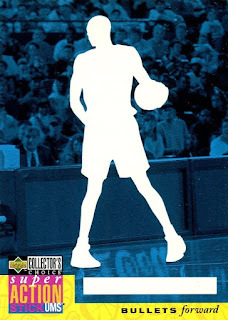 Even so, I want to follow the sport and continue my basketball collection. Due to the dark cloud the NBA left over the city of Seattle when the Sonics left, I can't in good conscience become an NBA fan. I try to resist the urge but sometimes I falter. I'll allow myself the sporadic retail packs and nothing more. 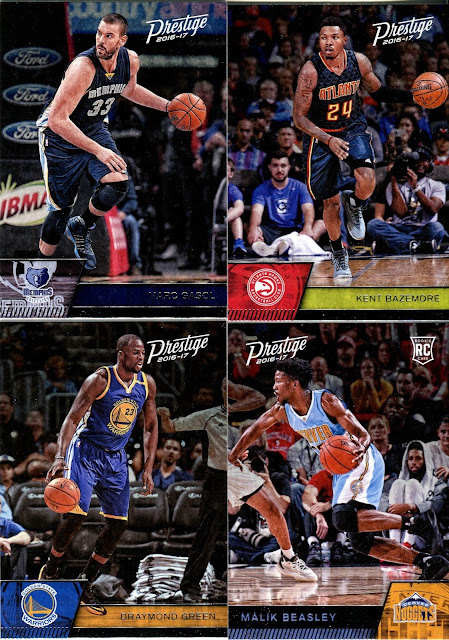 My Fred Meyer had a lone box of 2016-17 Panini Prestige so I had buy two packs to see how the design looks. 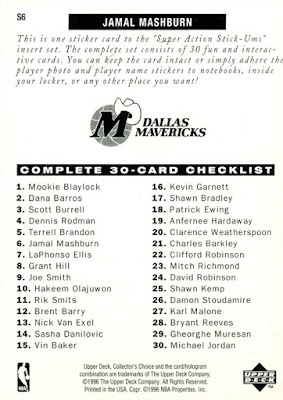 Only two names I recognize here: Draymond Green and Marc Gasol. Like I said, I don't really follow the sport. I like the base card design for its simplicity and full-framed photo. The rookie card of Beasley has the design elements switched so I wonder if that's consistent between all the rookie cards. 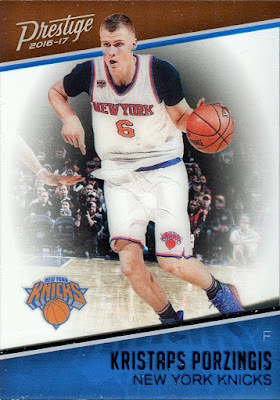 One insert in the first pack and it is an excellent card. Not necessary due to the player as Ingram has failed to "wow" the league this year. I just like the way the card is designed. 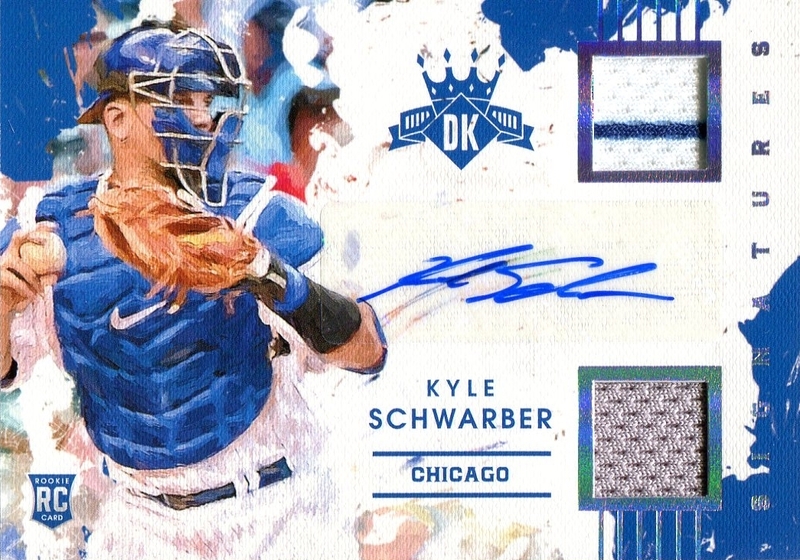 It's a tough card to scan as it's a rainbow foil with crystal pattern (similar to the cracked ice cards) embossed in the card. Furthermore, Ingram's head is in the background of the card, which does not show up at all in this scan. 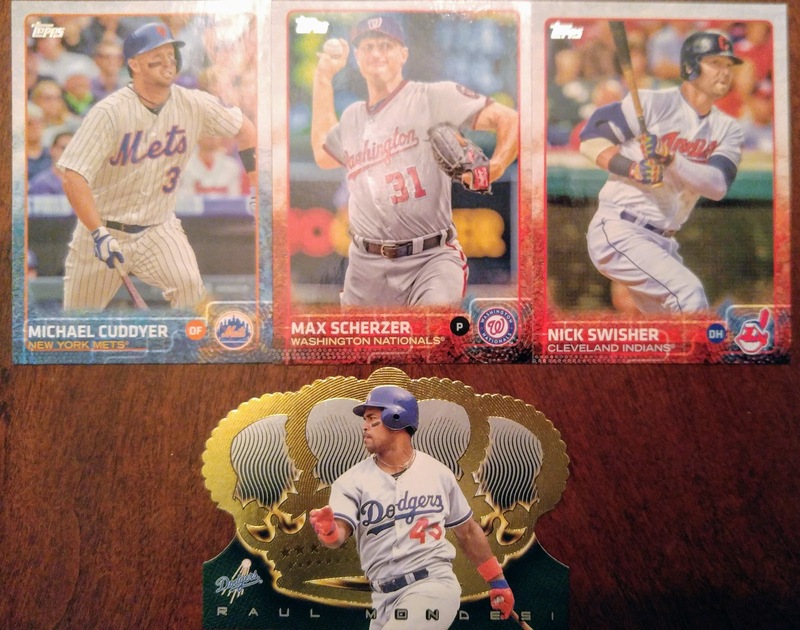 Only four base cards in my second pack, with two rookies. I like that kind of collation. I was also right about the design being switched for rookies and veterans. I recognize Jrue Holiday and Arron Afflalo from their days of playing with UCLA in the then PAC-10. Your look at the back of the base cards. Standard Panini fare with the repeating image and single year stats. I like how Panini at least color shaded the back image. C'mon Panini, you couldn't feature Ewing during his time as Supersonic? 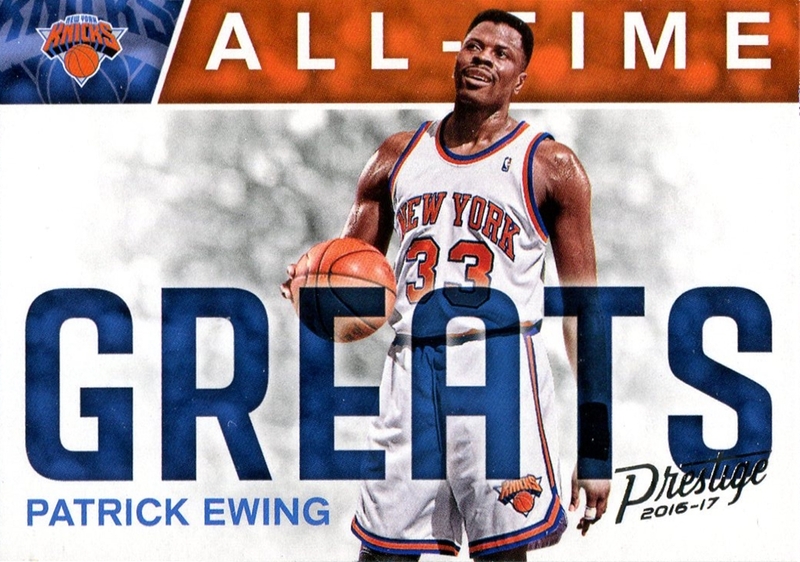 I kid, Ewing was on his last legs when he played in Seattle. 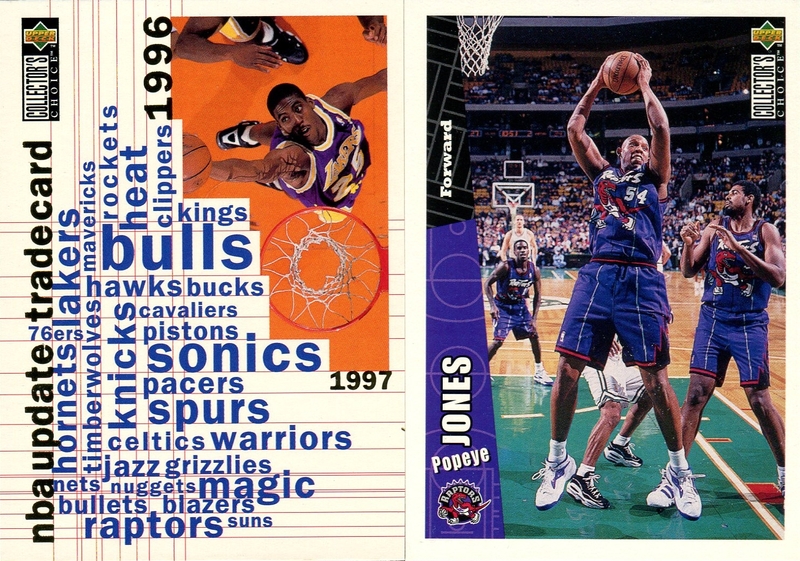 Although if I were to ever create an all-time Sonics binder, he would absolutely be in there. I think this is the Acetate insert. The card between the top and bottom banners is actually clear, with the exception of the Knicks logo and Porzingis. The crowd in the background is also translucent. 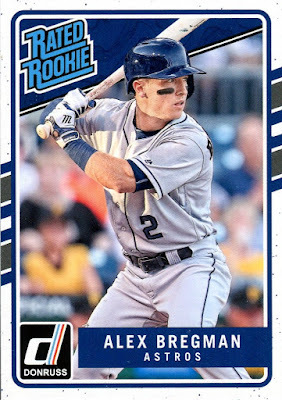 It's a neat looking card and it might actually be my first acetate card. For retail packs, I'm impressed that there was a pack for two insert cards. I expected only one. The base design is okay but the inserts were the attraction for me. I might consider buying another pack or two hoping for another interesting insert. Nachos Grande asked about the hardest button set to button collect in a Blog Bat Around. Three sets come to mind that have been difficult track down. If you asked me this question when I recently got back into collecting my answer would have been the 1997 Nintendo Power Mario Kart 64 set. I found a couple of these cards in my collection but I could not find any more information on the set. 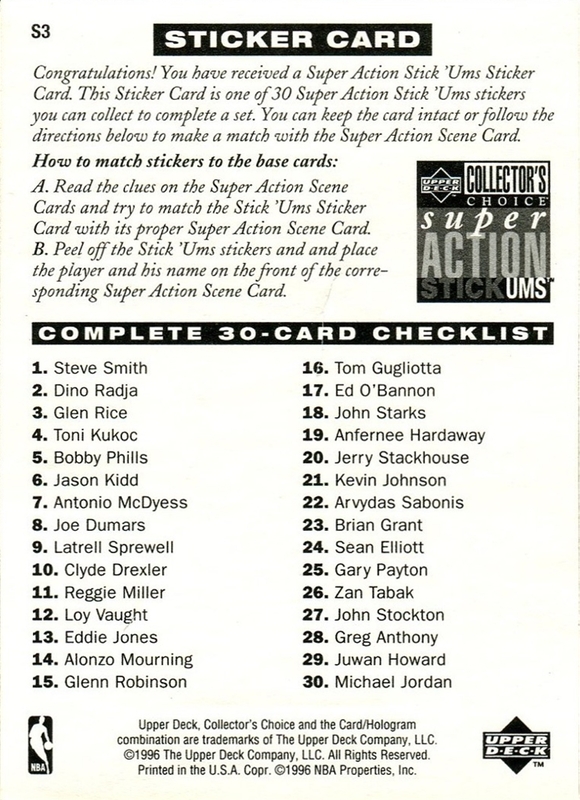 There was no checklist online. Google searches turned up some unhelpful images of the cards. I even found a Reddit post that was a couple years old and asked the poster if he still had the cards; he didn't. eBay was of no help either as the only cards for sale were an unopened pack going for something like $100. No thank you! Eventually, a few months later perhaps, a full set showed up on auction and I turned out victorious. This next set I've had great success tracking down through Beckett Marketplace and Sportlots for an inexpensive per card price. 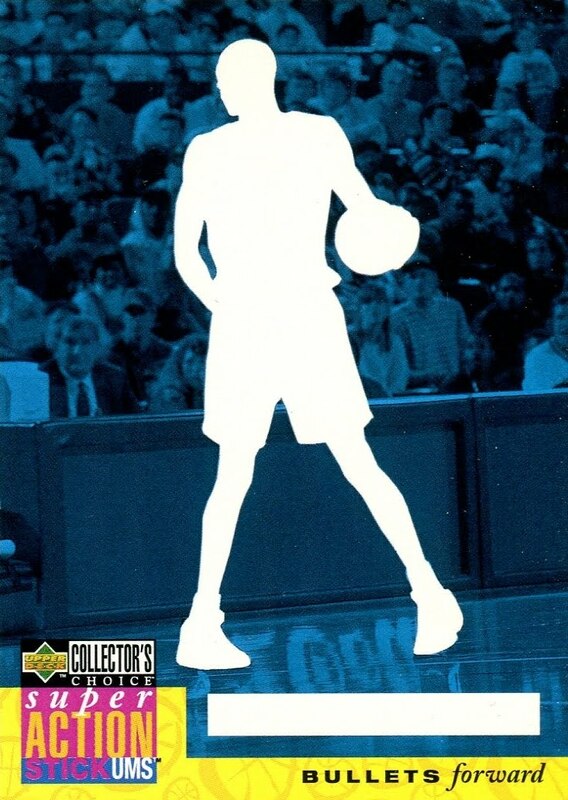 In addition to the base set of 1996-97 Collector's Choice basketball is a 30 card trade update set. 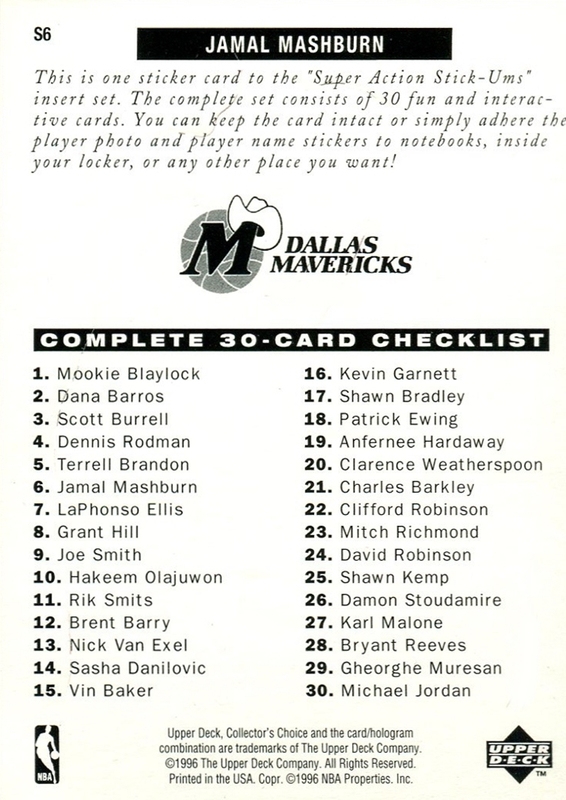 Included with Series 2 was a trade update card that you could exchange for the 30 card set at a later date. I had an easy time finding the exchange card but the rest of the 30 card set has taken some time. 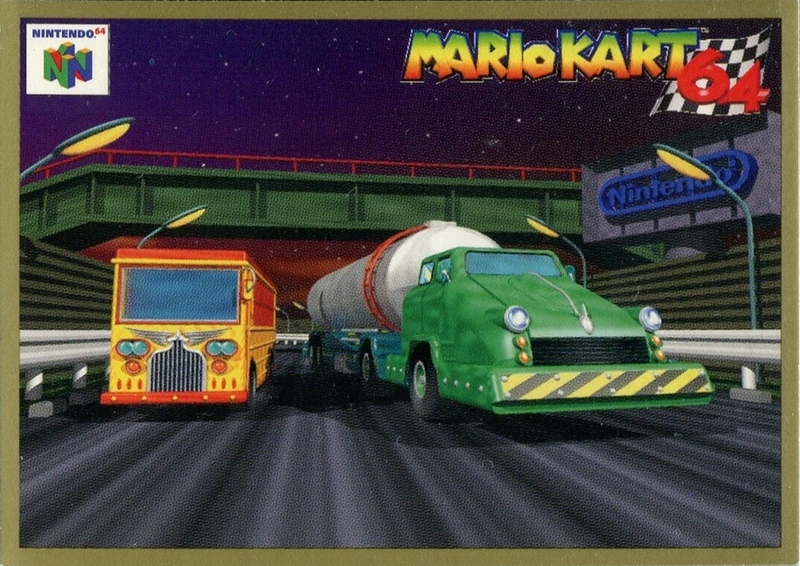 I wouldn't think these cards would that hard to find since Collector's Choice was widely available at their release. Yet here I am still missing 6 cards. 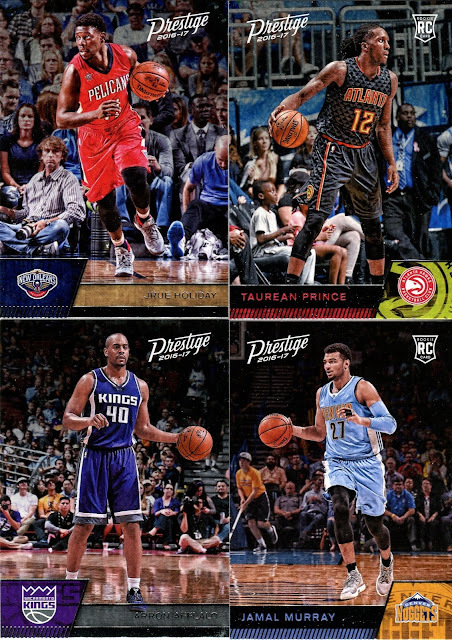 These cards are low priority so I don't search for them on a regular basis. The last set has been *impossible* to find. I have not seen these for sale. I have not even seen scans available for any of these cards so I couldn't show one if I wanted. This set is again from 1996-97 Collector's Choice: Stickums Base Series 1. 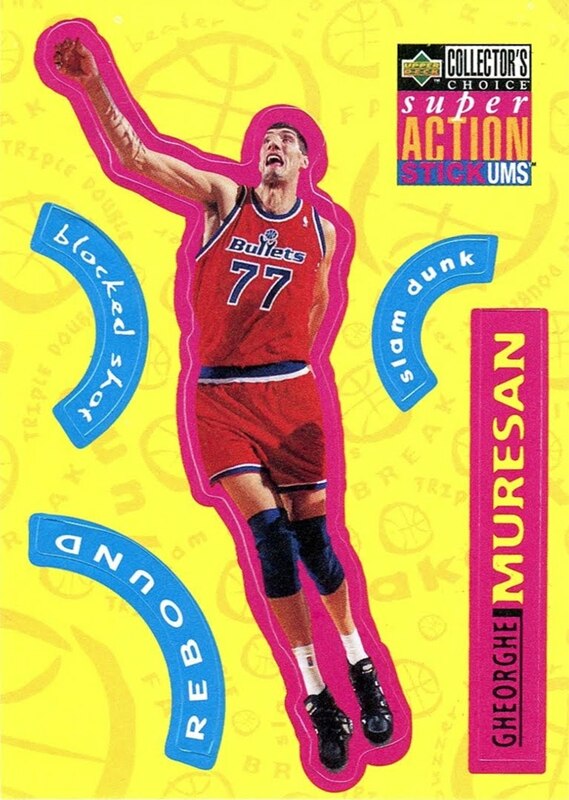 The Stickums set is made up of the stickers of players, plus the silhouette base card to attach your stickers. I have all the stickers from series 1 but even a single base card has eluded me. I think Billy Kingsley mentioned that the base Stick Ums from series 1 were a trade in or only available from certain packs. Either way, they were not widely available at release. I once bought a bunch from different sellers on Sportlots but of course the sellers were all wrong. Unfortunately, they did not have the right cards. The base cards do not have any names on them so it can be tricky to know if your base is from series 1 or 2. As the cards pictured above demonstrate, if you are paying attention, the stickers from series 1 clearly do not match the base from series 2. The team names match up across the different series but that's about it. I can understand the mix up but it is not excusable when you are selling online. I'm not giving up hope on finding this set. I'm not expecting to complete it anytime soon, either. Billy's comment below spurred me to examine the series 1 and 2 sticker cards. I've found a very important difference that maybe has unlocked the key to this mystery. 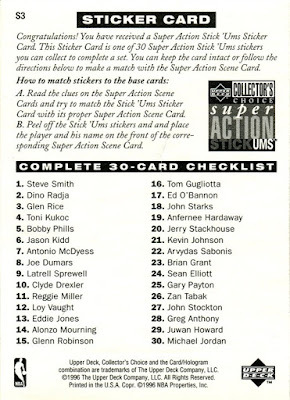 On the back of the series 2 stickers, it reads "you can keep the card intact or follow the directions below to make a match with the Super Action Scene Card." It's interesting that the series 1 card makes NO mention of the Stickums base, whereas the series 2 card explicitly mentions the base cards. 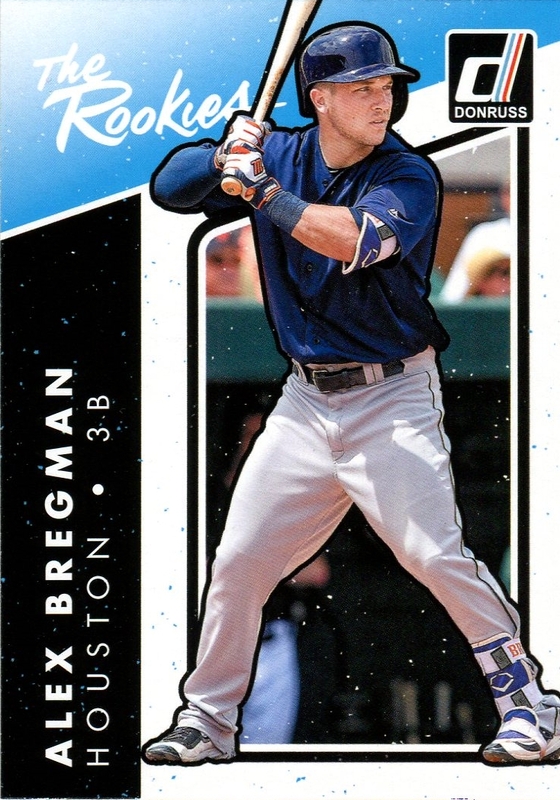 That strongly suggests to me that Upper Deck didn't make series 1 base cards. Honestly, this is enough to convince my collecting obsessive mind that my series 1 Stickums set is complete. Until I see otherwise, I'm going to assume the base cards do not exist. In between working overtime on Saturday and participating in a live, Legend of Zelda escape the room game, I manage to fit in a card show. This show advertised 45 tables booked, which would make for a big show. Unfortunately after working overtime, I didn't make it to the show until the afternoon so I couldn't spend as much time there as I would have liked. Probably for the best as my budget was only $12. A low budget meant I spent all time browsing the dime and quarter boxes. The first table I looked at didn't have that much that interested me but I saw cards for sets I needed. Nothing too fancy. 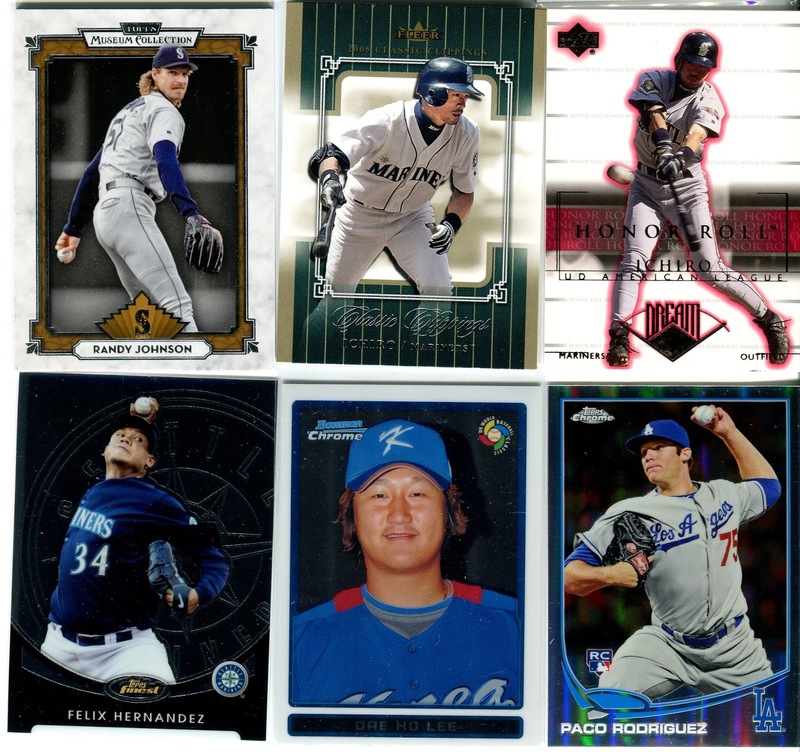 I need most of 2015 Topps Series 2 so I picked up about 10 cards. I also needed 1 more card to give me an even dollar amount so I found this Crown Royal die-cut of Raul Mondesi. 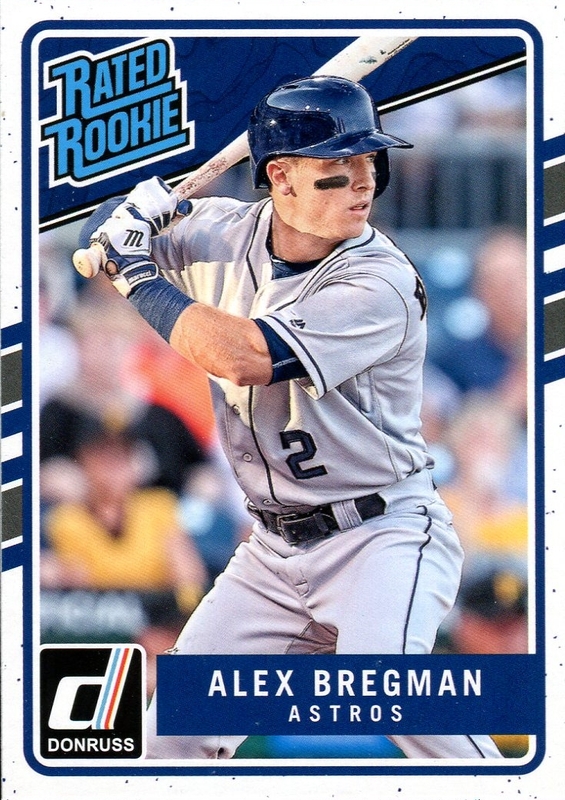 People typically like Bowman for the prospects and rookies but I like the design of 2016 Bowman that even the regular old pros are good enough for me. I hadn't actively been looking for base of Bowman but after seeing a fair number of Bowman, I decided to pick these up and add the set to my collection radar. 1992-93 Topps is a set that I'm always looking out for when I head to card shows. I've now realized I only have about 22% of the set so it might take me a finish up this set. A couple random Upper Deck cards to round out this table. After leaving this table part of me felt glad to knock down some set needs. A bigger part of me felt disappointed because my selections were so boring! Most of the cards above I could have just as easily purchased online. I feel like when I go to a card show I should grab something special. Something I wouldn't normally see. Well the next table scratched that itch. This will bump Griffey up to being #1 in my collection. Several more Mariners pick ups including a couple base cards from high end sets like Tribute and Museum Collection. I also snagged a 2009 WBC card of Dae Ho Lee who played for the Mariners last year after coming over from Korea. I think this card marks his first card appearance. 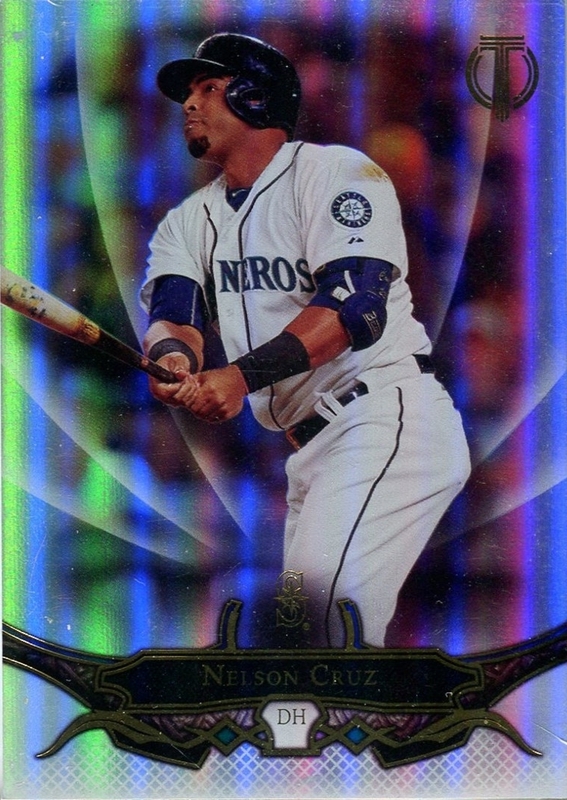 Lastly, and somewhat randomly, there is a 2013 Topps Chrome refractor. I picked up this card only for the fact that this set looks metallic. I'd say I made good use of my $12 coming away with some set needs and fun pick ups for the PC. I think the next card show will be in June and that should be the one that's only 5 minutes away. I can't wait! In addition to being an excellent cataloging website, the trading feature on the Trading Card Database makes it even better. Trades are simple to initiate and process. I've completed almost 20 trades and it's been a great way to pick up cards while clearing out duplicates. 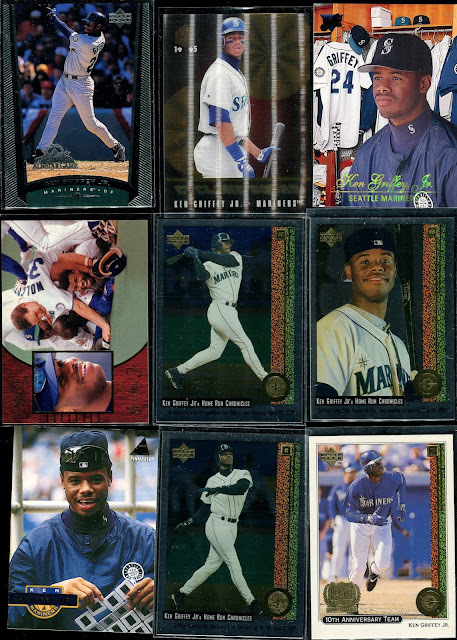 This first set of cards is a small collection of Mariners from 1996 Collector's Choice. 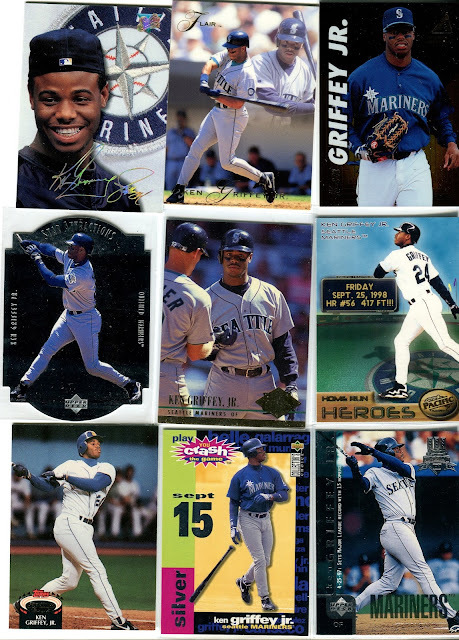 The year depicted on the cards, 1995, was a special year for the Mariners. That year the Mariners would see their first division title and their first post-season trip since their 1977 inception. They also won their first post-season series in dramatic fashion with a play that is revered as "The Double." The ALDS was tied 2 games a piece. The Mariners saw themselves down 5-4 in the bottom of the 11th against the hated Yankees. Edgar Martinez was at bat with two runners aboard. 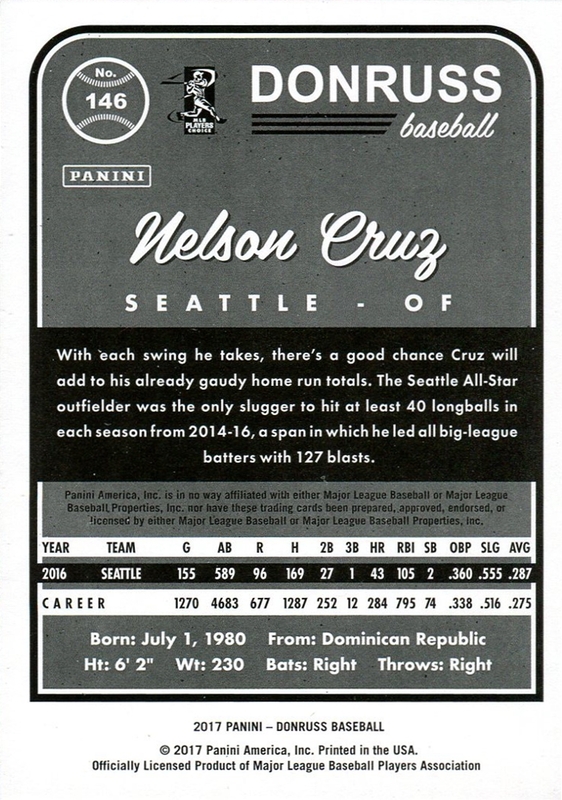 Edgar smacked a double down the left field line scoring both runners, which included Griffey scoring the winning run. That's why the two ALDS cards above are great to have in my collection. Until the Mariners with the World Series, that will be the greatest moment in Mariners history. Herkojerko must be a Phillies fan because he sent me a smattering of Phillies from 2008 Topps. 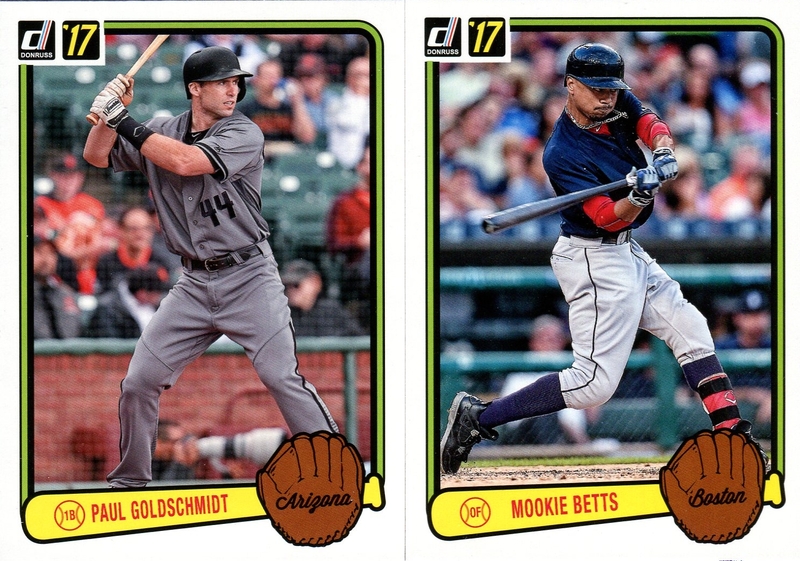 If I had a collecting goal for this year it would definitely be to finish the main 2008 Topps sets. I already have a factory set of flagship but I would like to have a hand collated set as well. In addition to the main set, I do need all of the other sets. Carlos Ruiz (middle right) is actually with the Mariners now, serving as a backup to Mike Zunino. Ruiz has worn #51 all through his career but it looks like he has taken on #52 for this season. Why the number change? #51 has been worn by Randy Johnson and Ichiro. Although the number is not retired yet and can technically be worn, my guess/hope is that he switched numbers out of respect to those two fabulous Mariners players. That number will certainly be retired once both Johnson and Ichiro are enshrined in the Hall of Fame. 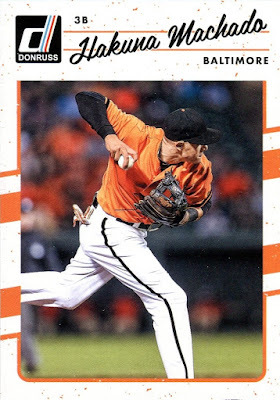 The Daily Dimwit is back up and running again after taking an extended hiatus from card blogging and card collecting in general. He stopped blogging shortly before I started blogging so I never read his blog before. I decided to give him a follow as he starts up again as he is posting some excellent cards over at his blog. He has been posting a lot about 2016 Panini Prime Cuts. This is a higher end release featuring relics and autographs, a la Topps Triple Threads. Since he is showing off his Prime Cut cards, I figured I would show off my one Prime Cut card I picked up on eBay a few weeks back for only a few dollars. Montas is no longer with the Dodgers, having been traded to the A's towards the end of last season. He currently ranks as the #10 prospect for the Athletics. He is a hard throwing right-hander who could be part of the A's rotation when the season opens up. I mainly picked up this card to start a semi-PC of the Dodgers as I've decided they are going to be my NL team to follow. Now that Montas is in the AL, and with a division rival no less, I can't root for him too much. Regardless, this was a nice looking card to pick up on the cheap. Thanks to The Daily Dimwit for the contest and I look forward to reading more of your blog! As if I needed a new card collecting project, I've picked up a few dual relics/autograph cards from one of my favorite sets of 2016: Panini Diamond Kings. I know a lot of people dislike Panini due to the lack of logos. I'm no fan of the logoless design either. 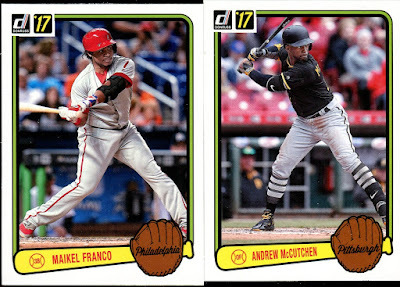 Blame Topps, blame MLB, maybe blame Panini (I don't know actually know their culpability) but this is the reality of today's cards. The checklist includes notable names such as Corey Seager, Kyle Schwarber, and Trea Turner. Plus, it's a relatively small set at only 19. 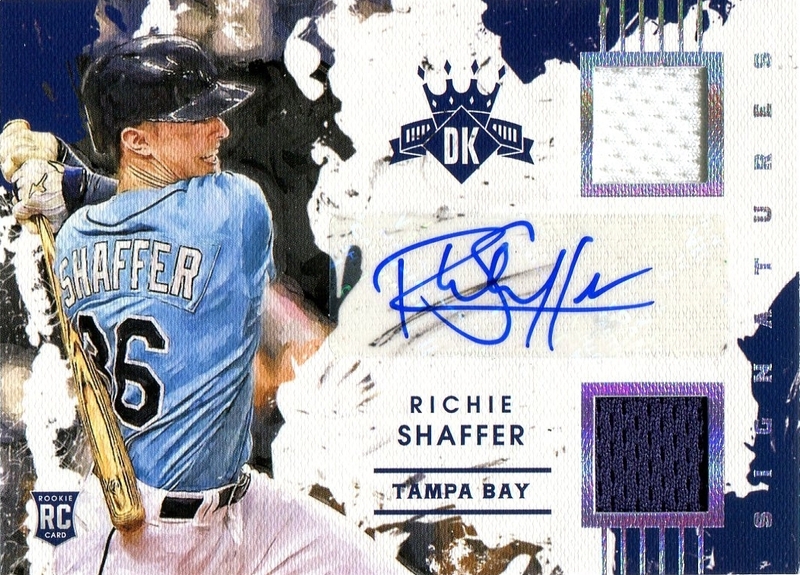 Given how much I liked the above card, I wanted to collect the rest and make this my first complete relic/auto insert set. 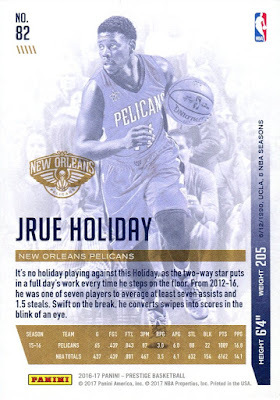 Curiously, the bronze cards have a lower print run than the silver set. Silver cards are SN299, which is the opposite of a typical rarity progression. Fine by me as I think the silver looks better anyway. 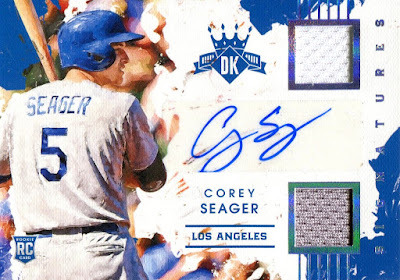 These were an excellent way to start my hunt for the complete set and with the Seager and Schwarber autos out of the way, finding the rest shouldn't be too hard.